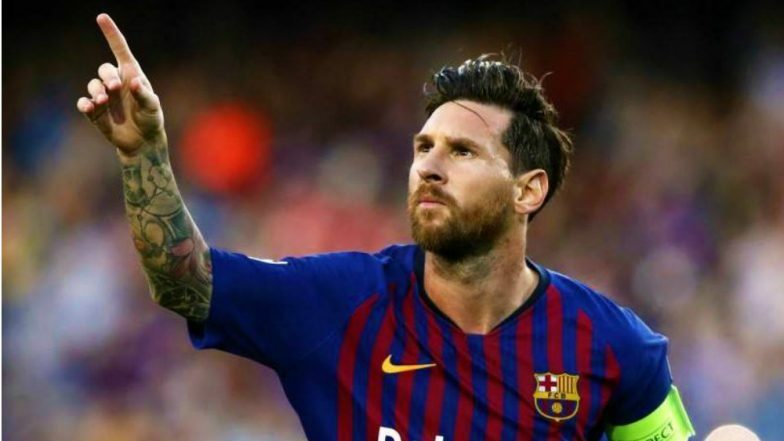 Manchester, April 10: Lionel Messi has a history of terrorising Manchester United but Ole Gunnar Solskjaer believes it is not impossible to stop the Barcelona star inflicting more damage in Wednesday's Champions League quarter-final. Messi scored in both of Barca's Champions League final victories over United, in 2009 and 2011, and is hungry to win the competition for a fifth time after crashing out at the last eight for the past three seasons. The Argentine has been in majestic form again this season, scoring 43 goals in 40 appearances to put Barca in position for a third treble in a decade. La Liga 2019: Lionel Messi's Free Kick in 90’ and Luis Suarez Last Minute Goal Lead Barcelona to 4-4 Draw vs Villarreal. "He is a fantastic player and will go down in history as one of the best individual players ever," said United boss Solskjaer ahead of the first leg of the tie at Old Trafford. "He will be difficult to stop but it is never impossible. It's not like it's Messi against Manchester United. "There is (Luis) Suarez, (Philippe) Coutinho, (Ivan) Rakitic, (Arturo) Vidal, there are so many good players we can't just focus on one player. We know we have to play against 11 of them." Messi stated before the season even began that his primary target was taking the Champions League back to Catalonia after the disappointment of blowing a 4-1 first-leg lead to bow out to Roma last season. Salt has been rubbed into the wounds for Barca because Real Madrid have won the competition in each of the past three seasons. However, Madrid have failed to even reach the last eight this year and Barcelona are considered firm favourites to make the last four against a United side sitting sixth in the Premier League, despite an upturn in form since Solskjaer replaced the sacked Jose Mourinho in December. The Red Devils, though, showed what they are capable of in the last 16 by becoming the first side ever to come back from losing the first leg of a European Cup tie 2-0 at home, beating free-spending Paris Saint-Germain on away goals. "The game against PSG is a great example," warned Barcelona defender and former United player Gerard Pique. "They (PSG) were better, but you cannot let United off the hook because they have a great team and a great history as they showed in Paris. "We learned (from Roma) that things happen, even if it seemed unimaginable that they will. We learned that you cannot let an opponent back into a tie if they are not killed off. That will help us for facing a team like United. "If at any point we can kill off the tie, we have to do it." United have lost three of their four games since victory in the French capital to crash out of the FA Cup and lose ground in the race for a top-four finish in the Premier League. But Solskjaer says his players believe another Champions League scalp is possible against the Spanish champions. La Liga 2019: Rayo Vallecano's Coach Miguel Angel Sanchez Munoz 'Michel' Sacked After Run of 7 Consecutive Defeats. "Of course when you get Barcelona, with the quality of their team, we know we need to step up our game," said Solskjaer. "We know we need to perform to our best levels, which we didn't against PSG at home. The outcome of the second leg against PSG has given the players and supporters belief that the same is possible against Barcelona." Solskjaer is hopeful that Marcus Rashford and Nemanja Matic will be fit despite failing to take a full part in training on Tuesday. Barca were given an injury boost with the news that Ousmane Dembele has been passed fit after a month out. However, the French World Cup player is not expected to start, with coach Ernesto Valverde saying he does not want to take the risk of aggravating his hamstring problem.